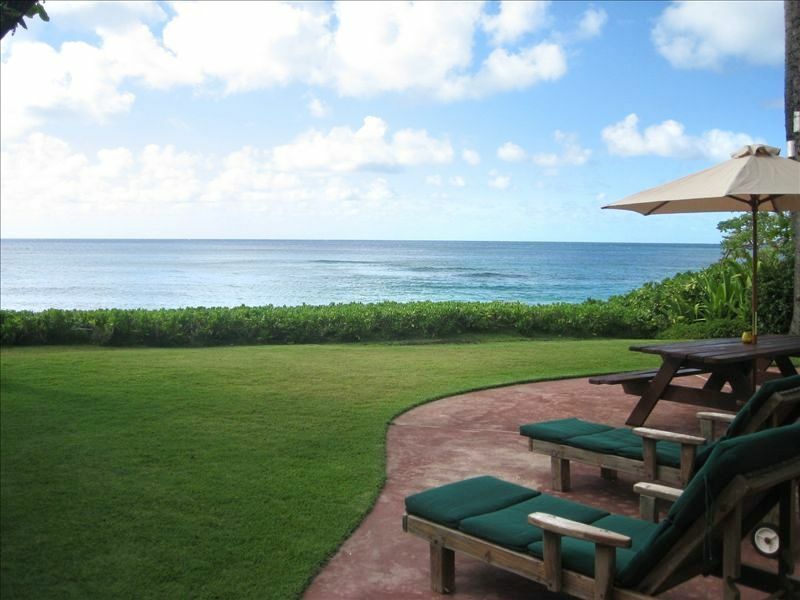 A Truly Luxury Beachfront Estate Located on World Famous Sunset Beach on Oahu's North Shore. Named 'Paradise on the Beach' at Sunset Beach by many guests this premier Direct Beachfront two-story, two large bedrooms, three full baths, executive style house affords the best in upscale style and luxury on the North Shore. This very private and quiet gated beachfront property sits on over 55+ feet of white sandy beach with direct ocean views of Sunset Beach from every room in the house, including the kitchen. You will afford the best location, the best property, with the best price the North Shore has to offer! The property is designed with high vaulted ceilings in both the upstairs bedrooms, berber carpet throughout, walk out sliding glass doors upstairs and downstairs and vast windows which encompass the natural surroundings of the Pacific Ocean around you. The master bedroom opens to the outside balcony via Anderson double wood sliding glass doors with spectacular direct 180' views of the Pacific Ocean, and the white sand beaches of Sunset. From the downstairs living room and dining room you can step directly out onto the patio deck with sweeping ocean views of Sunset Beach to Rocky Point. In addition, you can walk out onto the white sand beaches of Sunset Beach, Rocky Point and Pipeline straight from the backyard. The property comes furnished to the highest quality standard with tasteful and elegant custom imported koa and mahogany furniture throughout the house. Bed linens are of the highest quality 400 count Egyptain combed cotton as well as the bath towels. Beach towels are provided for each guest as well. The huge double room master suite includes a pillow-top king bed and an additional sofa sleeper in the adjoining sitting area, along with a 42' LED Flat Screen HDTV. The master bedroom upstairs opens to the outside balcony with 180' panoramic ocean views overlooking Sunset Beach and the Pacific Ocean. In addition, the master bathroom comes complete with a double granite vanity countertop and private bath. The second bedroom upstairs has a pillow-top queen bed, an additional futon couch, its own private full bath and ocean views. All three bathrooms have custom made granite countertops. The large gourmet kitchen boasts all G.E. stainless steel appliances as well as a G.E. four burner gas stove, microwave and convection oven for all your dining at the property. Coffee maker, blender and toaster are also standard fare in the kitchen. Enjoy outside barbecues on the sun deck with the gas BBQ grill and your favorite drink while watching whales swim by as the sun sets over the Pacific Ocean. Listen to the waves crash on the shore as you tan on lounge chairs on the patio deck or on your own private beach directly outside. Watch the 'Pipeline Pro' and World-class surfers tackle the huge waves of Sunset Beach and Rocky Point from the backyard or balcony of the master suite during the winter. Stroll down to the beach from the backyard for a swim, surf, beach walk or snorkel during the summer. Afterwards, rinse off in the outdoor hot shower under the warm trade winds. This beachfront estate is truly a gem on the North Shore! The property comes standard with high speed WiFi internet access throughout the house, two large flat screen LED HDTV's, Ipod connector, fax, copier, and scanner should you need to check in with the office back home while you watch the waves lapping on the beach in front of you! The property is located on the most desirable stretch of beach on the North Shore called the 'Seven Mile Miracle'. You can walk directly from the house on the beach to Sunset Point, Rocky Point, Pipeline and even Waimea Bay! Enjoy the miles of bike paths that run along the length of the North Shore from the property with the two beach bikes that are provided. Less than 1/2 mile away is the famous Teds Bakery and less than two miles away along the bike path is the Foodland Supermarket, many delicious dining options, surf shop and the Coffee Bean coffee shop. Turtle Bay Resort and Spa is a short five minute drive where you can find several fine dining restaurants, and the best golfing Hawaii has to offer. Site of the Senior PGA and LPGA tours during the past five years, the Turtle Bay Golf Course offers 36 spectactular holes of championship golf on two fabulous courses. There is also a first rate spa that can cater to any of your special needs along with excellent upscale dining options. Paradise on the Beach is a non-smoking rental. Please no parties, gatherings or weddings. Some properties on Oahu may have a minimum night stay. Paradise on the Beach represents a tremendous value for a premier direct beachfront property at Sunset Beach on the North Shore. Come see it for yourself, relax and enjoy your vacation....at Paradise on the Beach on Sunset Beach, North Shore Hawaii! Please inquire for availability and booking. Master Bathroom features granite countertops, double vanity sinks and beautiful custom Koa Wood Cabinetry. Second upstairs Bathroom features granite countertops, single vanity, custom Koa Wood Cabinetry and Soaker Bathtub. Third Bathroom downstairs features granite countertop, single vanity and custom Koa Wood Cabinetry. Direct Ocean Views and Direct beachfront access to the beach the from property. Property sits directly on over 55+ feet of white sandy beach, fronting famous Sunset Beach. There is direct private beach access to Sunset Beach from the property. Mountain View from the back windows in the second bedroom and from the back window from the master bathroom. Ocean Views from virtually every room in the house including the kitchen. Full Kitchen, with all G.E. Stainless Steel appliances. Manicured El Toro Grass Lawn, with manicured Native and Hawaiian plants surround the property. Beachfront Balcony with 180 degree Ocean Views and additional seating area and deck chairs. Beachfron Patio/Deck with Direct Ocean Views, picnic table with umbrella and two custom made teak chaise lounge chairs. Mask, fins and snorkel rentals available. Wireless High Speed Broadband Internet, Two large screen LED/HDTV's. 55' Samsung LED HDTV in the living room and a second 42' Samsung LED HDTV located in the master bedroom. Two Bose DVD/CD Surround Sound Systems, Fax, Copier, Scanner, Security Alarm, Fins, Masks, Snorkels and Beach Mats available on site. Beach towels are provided for guests at the property. Beautiful home situated perfectly on famous Sunset Beach. Enjoyed beautiful sunsets with family every night. None were the same. Sound of the ocean just outside made sleeping a restful experience. North Shore is so much better than the hustle and bustle of Honolulu. Enjoyed all the North Shore sites and found a few hidden gems as well. Not a far drive to the PCC, which is a must experience. Fortunate to witness monk seals and sea turtles in their natural environment not far from the property. We were able to enjoy the Turtle Bay Resort fireworks show on the 4th from the backyard of the property as well... Bonus!!! Perfect property for a Hawaii vacation.